I had never been to Piccolo on the beach prior to their remodel. One of my girlfriends, a lady of Venice, had eaten dinner there however and had raved about it – so I was excited when I was invited to taste their food. Piccolo is now twice the size it once was, but to my observation it had the charm to match their expansion. I appreciated the open kitchen, which really added to the still-intimate, neighborhood feel of the restaurant. Italian hospitality is exuded by every employee there. The fact that the food also delivers will make you forget that you are dining on the beach without so much as a view of it, lest you score one of the few outdoor patio spots. We’re not in Malibu, anymore. The saying is “location, location, location” (not “view, view, view”), and it seems that Piccolo is more than content to rest its reputation on its food with its locale reflecting its desire to be Venice’s Northern Italian speakeasy. Only public parking is available, and expect no apologies about it – your reward comes in the cuisine. 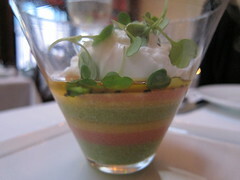 We started out withÂ Chef Roberto’s new-for-summer revision ofÂ Caprese as we knew it – with burrata and micro cilantro topping a multi-colored and -layered, fluffyÂ gelee floated with olive oil and seasoned with a delicious Hawaiian Lava salt. It was refreshing, delightful and a nice introduction to what followed. 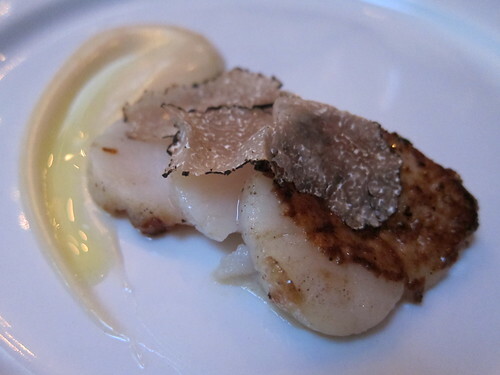 With our palates opened, we were ready to enjoy a tasting-sized yet indulgent serving of seared sea scallops – perfectly done so with flavorfulÂ brown coloringÂ on one side of the sliced scallopÂ to reveal an ever slim ring outside a tender center on the other. The thin shaving of truffle, as always, was magic – yet I couldn’t leave a drop of the creamy parmasan fondue on my plate. All three components together are a match made in heaven – made in no small part by its proportioning. 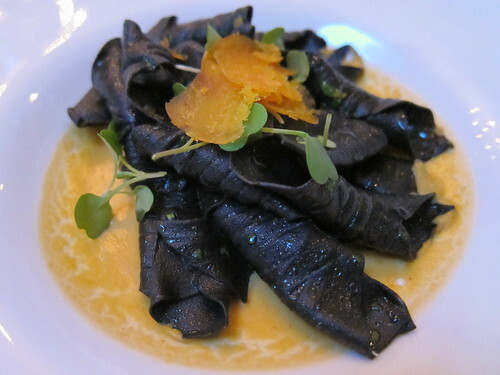 The Squid Ink Garganelli was another favorite, with the dark, ridged rolls having that perfect al dente bite; soggy, Americanized pasta seemed more than just blocks away. The earthiness of the egg pasta was further rounded out by shavings of dried, salted quail egg yolk (alternately substituted withÂ bottarga shavings) and the delicious sea urchin emulsion the pasta lay upon. We partook after tossing. The fullness of the egg pasta infused with squid inkÂ was so delicious and could only come straight from the sea – yet precludedÂ the saltiness that the inclusion of shellfish would bring. In this dish, I appreciated that the salt elementÂ was subtle enough to really let the squid ink really shine. The housemade wild boar sausage risotto was also delicious. It had real depth thanks to the bits of sausage and almost-smoky tomato-based sauce. The risotto did well in holding flavor of the sauce whileÂ the consistency of each grain remained deliciously firm at the center – the way risotto should be. 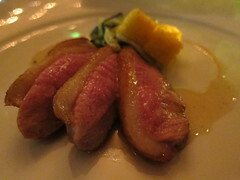 The seared slices of duck breast had a delicious layer of fat which was so perfect in absorbing the truffled-honey sauce it was dressed with. It’s an indulgent, sweet Secondi and I would easily order it again (once I had tried most other things on the menu, that is). If sweet, rich and tender bird is your speed, you should definitely order this dish. The pickled greens and cubes of what seemed to be cornbread were great accompaniments, cutting the richness while complimenting the duck slices. I had the opportunity to visit Pourtal recently for one of their tasting events. 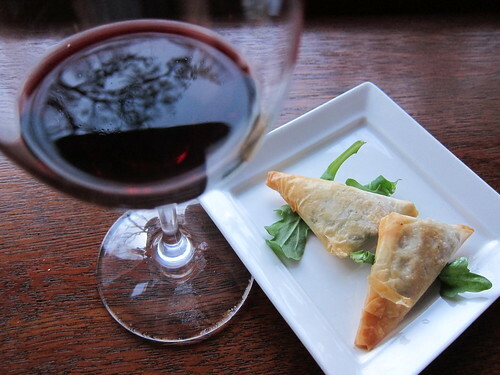 It was a really fun experience and there’s always opportunity to learn just a bit more about wine while enjoying the pairings with bite-sized food. Fortunately, they always have educational &Â libational eventsÂ coming up – including tonight, which particularly piqued my interest. Why? For today’s installmentÂ of Pourtal’s participation inÂ â€œNatural Wine Week LAâ€ (going on through Sunday),Â they’re hosting Jared Brandt from 7 – 9 PM, who hails from the the wife &Â husband-owned Donkey and Goat winery. Operating out of Berkeley, Tracey and Jared Brandt are the â€œ…donkey and goat behind these naturally made wines that are distinctive, soulful and truly represent the earth from which they come.” I first tried their 2009Â “Isabel’s Cuvee” Granche Rose at Allston Yacht Club with H.C. and can honestly say this is probably one of the only roses I would heartily recommend given my limited rose knowledge. The whole tasting of 5 Donkey and Goat wines is only $15. Arrive at Pourtal a little early for their 4 – 7 PM Happy Hour to take advantage of their $5 glasses of wine and $4 delicious eats (try their tater tots) and you’re set. In the meantime, have a great weekend, everyone. Don’t forget that Cinespia in the Hollywood Forever Cemetery kicks the summer off tomorrow with a screening of Wizard of Oz ($10 donation). Also, the all-new Nice Cream Vegan Ice Cream parlor opens on the Cahuenga Pass in Studio City. Sure, Halloween is over – but there are still plenty other reasons to get festive! Dean Hewitson, known as the “Mad Hatter” of Hewitson Wines, will be visiting Los Angeles tomorrow from South Australia on his U.S. tour celebrating the debut of his limited-release 2006 vintage Mad Hatter Shiraz. There will be a wine reception followed by a five-course pairing dinner with the Shiraz as well as other Hewitson wines – all in a whimsical “Mad Hatter” setting for your merriment and enjoyment. 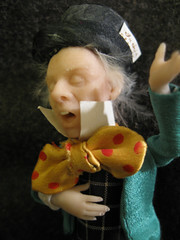 You’re even encouraged to come in your own “mad hat” to participate in the fun! Reserve your spot ASAP as they are limited. Apparently, this was their 2nd time holding the event and it definitely did not disappoint. 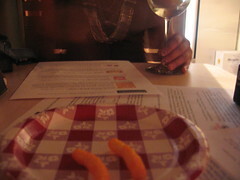 I had a great time with HC of LA-OC Foodie and Caroline. LuckilyÂ they arrived earlier thanÂ I did andÂ were able to snag a table for us three to sit comfortably. And the 4-courseÂ menu?